The Papua New Guinean-born Genia made his Super 14 bow for the Reds as a 19-year-old despite not having played in a senior club match in the state. Boasting a sharp sense of anticipation and a swift pass, Genia played for Australia U20s at ther 2008 IRB Junior World Championship before dueling with last year's Australia A representative Ben Lucas for the Queensland No.9 shirt throughout the 2009 Super 14. He was suspended for three weeks during the season for a high tackle against the Sharks but bounced back from the setback with a sparkling run of form that caught the eye of Wallabies coach Robbie Deans. He made his debut against New Zealand in the opening clash of the 2009 Tri-Nations and would later earn his first start against South Africa in Brisbane. Genia cemented his place in the side with a string of fine performances and grabbed his first international try against England on his way to the Man of the Match honour during the end of year tour of Europe. In 2010 he spearheaded the resurgent Reds' push for Super 14 honours, alongside half-back partner and Wallabies team-mate Quade Cooper and was handed the captaincy of the side when his former school-mate James Horwill's season was ended by injury. In 2011, Genia was a key part of the Reds side that won the inaugural Super Rugby title and was named Man of the Match in the Wallabies' opening Tri-Nations Test - a big win over South Africa in Sydney. His spectacular form was recognised by the Australian rugby writers as he took Australia's Super Rugby Player of the Year in June 2011. Genia was a key part of the Wallabies team for the 2011 World Cup having been named in their 30-man squad for the tournament. 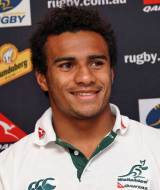 Genia impressed again during teh 2012 Super Rugby season for the Reds - again being named Australia's player of the tournament - and opted to remain with the Queensland franchise despite having said he would join the Western Force. His brother, Francis Genia, plays for the Papua New Guinea national rugby union team.